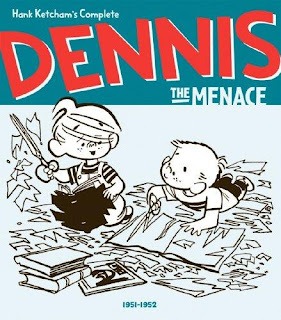 SYNOPSIS - DENNIS THE MENACE has, for over 50 years, captured the mischievous, rambunctious, anarchic worldview of a kid better than any other cartoon strip. It is the most hilariously observed and empathetic comic strips about childhood ever drawn - with a sly humour that kids identify with and parents nod knowingly - and ruefully - at. Where do i start?? Firstly, these two volumes are the very first sketches of Dennis by Hank. And when Flipkart delivered, it was like holding a baby in my hands. And boy oh boy, every SINGLE page is meant to be treasured. Volume One begins with a foreword by Patrick McDonnell who is a freelance illustrator and also an introduction by Brian Walker who is a proffessional cartoonist in the panel porducing the Beetle Bailey comic strip. The Dennis we all learnt to love and enjoy started in these pages. One afternoon, in October 1950, Hank's wife, Alice, stormed into the room of his studio and exclaimed, "Your son is a menace!". Four-year-old Dennis Lloyd Ketcham, who was supposed to be sleeping, had just demolished the room. "Dennis.....a menace? ", Ketcham mused. And as we know after that, the rest is all history. Dennis soon began to be published in more than 100 papers in the country and now it is a global figure. Ketcham's cast consisted of Dennis, his parents Henry and Alice Mitchell, neighbours Mr and Mrs Wilson and Ruff. Slowly, Gina and Margaret and Joey were introduced into the cast. Dennis Mitchell has always been a "five-ana-half" years old. Ruff, his dog was his constant companion who almost never minded being bossed around. As i went through the volumes, i realised how much of innocence and creativity had gone to the creation of Dennis. Ketcham didn't like doing comic strips. He strictly wanted to do panel art which he loved. He put more emphasis on the shades and the angle of projection of his art rather than the words. He himself said once "i try to draw so convincingly that the reader won't notice." At a time when comics were just a tiny piece of space in a newspaper, Ketcham wanted to create a character that the reader would give just a few seconds of his time and yet would make them smile. This two volumes are full of his four years of panel art. And they are perfection magnified. What made Dennis so popular? I guess we all know. 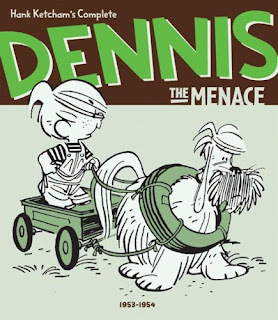 Everyone of us had that Dennis gene in us when we were young. Though ofcourse we weren't so bold enough or maybe a few of us were (nods to self). Dennis is THAT kid everyone recognised as his or her offspring. And with Dennis came Mischief. But it was the good kinda mischief resulting from good intentions and misguided helpfullness. Though he surely was a devil at times. How many times have we seen him steal cookies or do something to antagonise Mr.Wilson.... And as Ketcham said, "A world without any Dennises would be dull. Peaceful, maybe, but dull." This two volumes captures every day of the first four years of Hank's creation in the newspapers. We see Dennis stealing cookies, giving his dad heart attacks every time with his good natured antics. He puts his dad in impossible situations, tries to please his mother by calling her gorgeous just so he can get to eat cake. The situations with his babysitter are epic as well as the ones whenever he visits the barber's. His favorite line is 'come and make me' and i swear my tummy ached with all the laughter i came out with. Whenever he is punished, Dennis is made to sit in the corner of a room with his face to the corner and there, he prays and promises to be good for the rest of his life. By next morning, its back to ol' Dennis Mitchell again. You won't be finding Joey or Gina or Margaret in these two volumes as they were introduced in the mid 50's. But Dennis with Ruff is more than enough to make you want more. My Rating - 5 out of 5. This is a timeless collectible people. You just can't NOT have it. Have given you an award! This is for blogs which have less than 200 followers.